Realm of Horror - News and Blog: GHOST STORIES comes to UK Disc & Digital this August. GHOST STORIES comes to UK Disc & Digital this August. How reliable is the human mind? Does your brain always tell you the truth? Be prepared to have your perceptions skewed and your mind blown and GHOST STORIES arrives on Digital Download 20th August and on BD and DVD on 27th August, courtesy of Lionsgate Home Entertainment. Professor Phillip Goodman (Andy Nyman - The Commuter, Death at a Funeral) is a devoted sceptic of all things supernatural. When given the opportunity to investigate three unsolved paranormalk cases, he uncovers mysteries beyond his own imagination, eacj more the frightening, uncanny and inexplicable than the last. Culminating in a nightmarish conclusion that forces him to question hos once unwavering beliefs, goodman's cynicism is put to the test by the macabre and sinisyer mysteries unravelling before him. 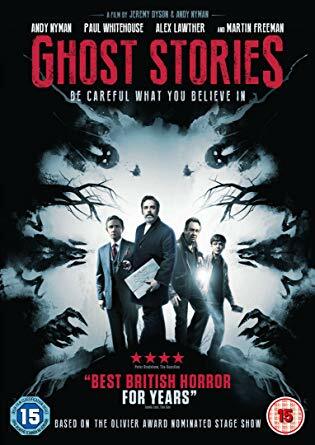 Written and directed by Andy Nyman and Jeremy Dyson (The League of Gentlemen), GHOST STORIES is an intelligent and terrifying British psychological horror that warps your perceptions, makes you mistrust your memory andpushes your imagination to its limits. With show stopping performances from Paul Whitehouse (The Death of Stalin), Alex Lawther (TVs The End of the F***ing World) and Martin Freeman (The Hobbit franchise), GHOST STORIES is an unmissable nail biting enigma that dares to be solved. The BD also includes a reversibale sleeve, a 16 page booklet and an alternate poster from noted horror artist Graham Humphries.